Source: CICH graphic created using data from Crengle,S., Freemantle, J., Gallaher, G., McAullay, D., McShane, K., & Taualii, M. (2009). Indigenous Children’s Health Report: Health Assessment in Action. Edited by Janet Smylie and Paul Adomako reference data from Aboriginal Children’s Survey, 2006; Regional Health Survey 2002/2003; National Longitudinal Survey of Children and Youth 2000/2001. http://caid.ca/IndChiHeaRep2009.pdf -accessed August 2, 2017. 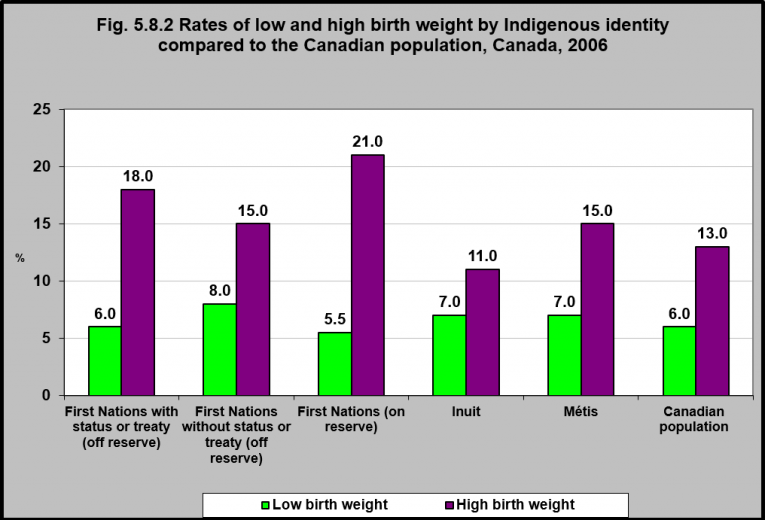 In 2006, First Nations living off reserve with and without registered Indian status (18% and 15% respectively), First Nations living on reserve (21%) and Métis (15%) mothers had babies of higher birth weight compared to the Canadian population (13%). The rate for Inuit mothers was slightly less at 11%. For low birth weight, the rate for the Canadian population was 6%. All Indigenous groups had higher low birth weight rates except First Nations on reserve who had a slightly lower rate at 5.5%. First Nations on reserve mothers also had the highest high birth weight rate at 21%. 1Belbasis, L., Savvidou, M.D., Kanu, C., Evangelou, E., & Tzoulaki, I. (2016). Birth weight in relation to health and disease in later life: An umbrella review of systematic reviews and meta-analyses. BMC Medicine, 14, 147. 2University of Rochester Medical Center. (2017). Large for gestational age. Adult and children’s health encyclopedia. https://www.urmc.rochester.edu/encyclopedia/content.aspx?ContentTypeID=90&ContentID=P02383 -accessed October 7, 2017.